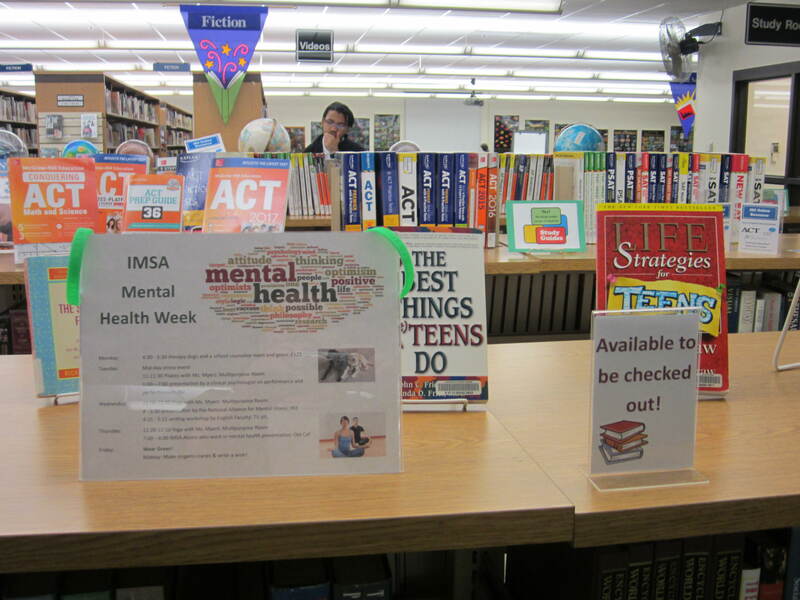 The Student Council’s annual Mental Health Initiative Week is November 28 – December 2, 2016, and books and dvds addressing mental health issues are on display in the IRC and available for checkout. 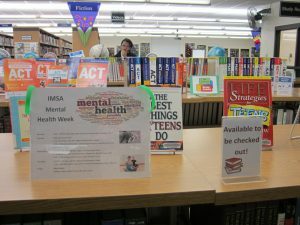 Madison Dong, Student Council President, sent out an email with a schedule of the week’s events, which includes activities and seminars that can help students identify mental health issues. 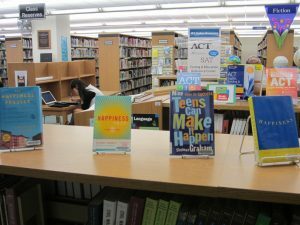 The books and dvds on display in the reference area of the IRC can supplement these activities. 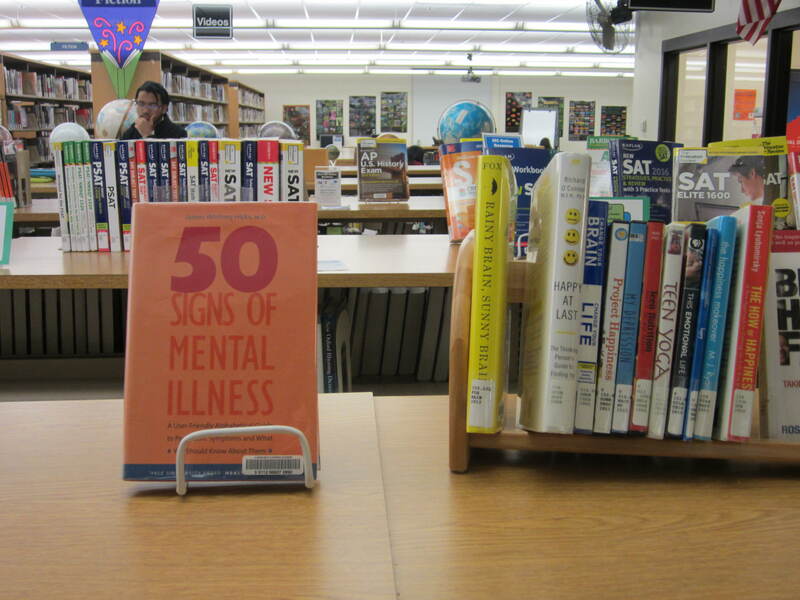 If any of the weekly activities spark an interest, please stop by the IRC to check out resources that can help you explore mental health issues. E121 will be therapy dogs and a school counselor meet and greet. there will be a writing workshop by some of the English faculty. 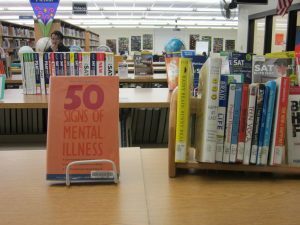 anxiety and discuss their own IMSA experiences as well. cranes and put them up for display after the week. Please ask any IRC staffer for help if you have questions. This entry was posted in Displays, Events on November 29, 2016 by nluebke. The 11th Annual Family Reading Night at the Illinois Mathematics and Science Academy is scheduled for Thursday evening, November 17, 2016 from 6:00 p.m. until 8 p.m. 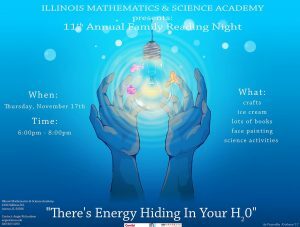 This year’s theme is “There’s Energy Hiding in Your H20,” and the event is sponsored by IN2/ComEd. Families in the Aurora area will get together at IMSA for an evening of story time, crafts, science and just plain fun! Last year over 150 grade school students and parent(s) from Aurora school districts 129 and 131 were excited to attend. Every child in attendance will receive a book, a t-shirt, a backpack, candy and a water bottle. Oberweis Dairy of North Aurora provides an ice cream treat for each attendee. The Aurora Public Library and SciTech also participate in the nights festivities. 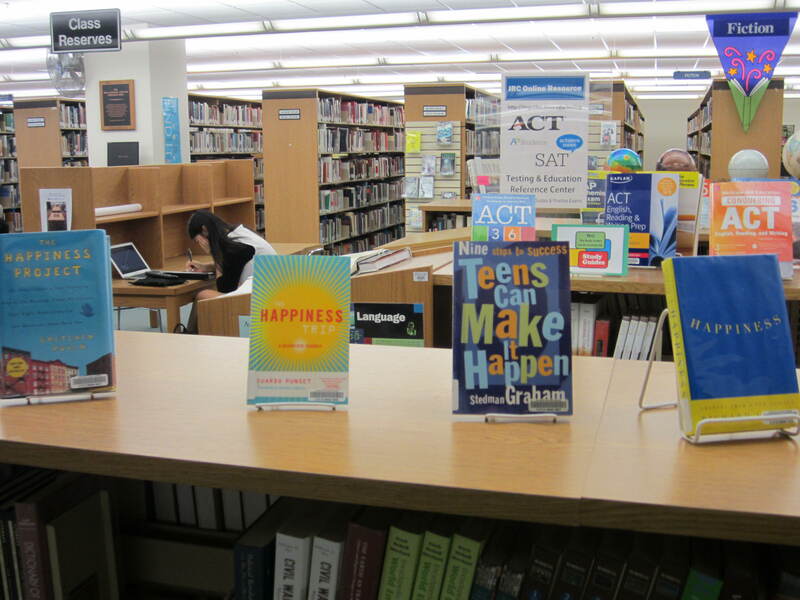 Parents can take a tour of the school or hear about other programs offered at IMSA. Raffles will also take place during the night and include scientific toys, movie passes, restaurant gift cards, East and West Aurora High School basketball family game passes and other goodies. To attend Family Reading Night, students must pre-register. Please contact Angela Richardson @ 630.907.5075 or angie@imsa.edu for more information or to register. This entry was posted in Announcements on November 10, 2016 by nluebke.